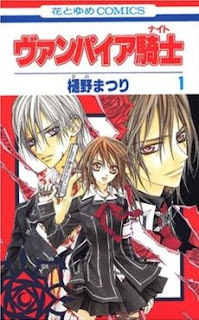 Vampire Knight (ヴァンパイア騎士, Banpaia Naito?) is a shōjo manga and anime series written by Matsuri Hino. The series premiered in the January 2005 issue of LaLa magazine and is still on-going. Chapters are collected and published in collected volumes by Hakusensha, with eleven volumes currently released in Japan. The manga series is licensed in English by Viz Media, who has released ten volumes so far. The English adaptation premiered in the July 2006 issue of Viz's Shojo Beat magazine, with the collected volumes being published on a quarterly basis. Two drama CDs were created for the series, as well as a twenty-six episode anime adaptation. Produced by Studio Deen, the anime series' first season aired in Japan on TV Tokyo between April 8, 2008 and July 1, 2008. The second season, titled Vampire Knight Guilty aired on the same station from October 7, 2008 and December 30, 2008. The anime uses many of the same voice actors as were used for the drama CDs. The anime adaptations have been licensed for release in North America by Viz Media. Yuuki Cross' earliest memory is of a snowy night in winter, when she was attacked by an evil Level E vampire and was saved by a kind vampire, Kaname Kuran. Yuuki is the adopted daughter of the Headmaster of Cross Academy, Kaien Cross, who is an ex-vampire hunter that now wishes for vampires and humans to live alongside peacefully. She has grown up and become a prefect for the school which has one main purpose: for vampires to coexist peacefully with humans. Her fellow guardian and childhood companion, Zero Kiryu, whose parents were killed by a pure-blood vampire, is now determined to kill them all and refuses to trust them. Zero himself is now manifesting vampire traits, having been turned into a vampire after he was bitten by the Pureblood vampire who attacked his family, Shizuka Hio, four years earlier. Yuuki tries to help him fight his bloodlust while also seeking to recover the memories she lost. As the series progresses, Zero's thirst for blood leads to his drinking from Yuuki, by her consent, to avoid becoming a level E vampire and losing himself to his monstrous instincts. To stop this, Kaname gives Zero his own "pure" blood, even though the only way for an ex-human to become a truly "stabilized" vampire is to drink the blood of the one who bit them in the first place. However, since Kaname is a Pureblood, his own blood helps keep Zero from going insane and from needing to feed from Yuuki. Eventually, it is revealed that Yuuki is a Pureblood vampire herself, the Pureblood Princess of the Kurans and the fiancee of Kaname. It is also revealed that Kaname is Yuuki's elder brother and they spent their childhood together. Although, despite this being what Yuuki grew up believing, Kaname is not Yuuki's blood brother, but the ancient ancestor of the Kuran family resurrected by Rido Kuran. To save Yuki from being killed by Rido Kuran, their uncle, her mother had sealed her memories shortly before her own death and put Yuuki under a spell so she could live as a human and avoid being found. After Yuuki reawakens to her vampire nature, Rido again tries to kill her. As Kaname kills the corrupt vampire senate, Yuuki fights Rido. During a fierce battle, Zero aids her in killing him, but later on tells her he will have to kill her when he sees her once again. She tells him that she will keep running, so that he will have a reason to live. Although this is where the anime ends, the manga continues the story and is updated monthly in LaLa Magazine. 0 komentar on "Vampire Knights Guilty"